Light, refreshing and mighty delicious, but not very filling – so we just add some chicken to remedy that. Remove from heat and remove mushrooms to slice up smaller. Return mushrooms to pot and pot to medium high heat. Simmer until mushrooms are soft. Just heat through – don’t boil after the miso is added. I love this! Simple and healthy. Can’t beat that! Out of all the soups you’ve posted here I think this is my favorite. There is just something I really love about Miso soup. They all look fantastic! 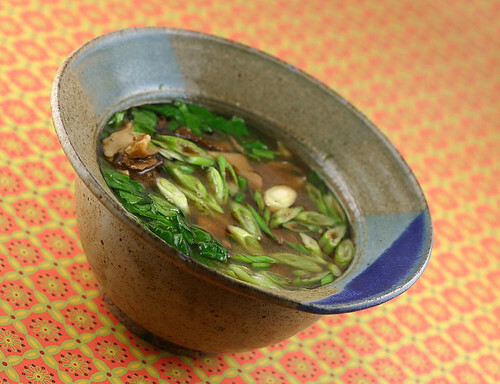 Dear Foododelmundo, I did not know how to make miso soup until I read your post! When I saw it I said OMG! Incredible presentation. Loved your site, very professional. Photos were crisp and clear. Recipe was concise and easy to read. I shall be back for a bite of more.